amzing design . .superlykk !!! can u tell me the size of the bed ? it seems to be queen size bed ?? What color of paint are the walls? Love the linens- where are they from and what colors are they? Console - Where is the mirrored console table from? Accedd2designs, I can't believe u would throw interior designers under the bus and cut them out with your website! Pretty sad that people like u are taking away from hard working interior designers! I am so sorry for your misunderstanding of my services. I am actually an interior designer and I pride myself on servicing my clients. I also understand that the world is changing and there are design savvy people out there that would like access to "to the trade only" products… So why not assist them with this need, it is my duty as a designer. There are plenty of people that are still in need of our talents as designers as I believe the houzz site proves over and over again. Not to mention the fact that the houzz site offers people the ability to purchase design items as well under their PRODUCTS tab. It's all about service. Thank you so much for the opportunity to explain my services katiekos57, I truly wish you the best and would love to work with you for any design needs you may have in the future. where did you find that bench seat at the end of the bed? This bench is actually called the "Canzo Bench" from Phillips Scott and can be purchased on our new and exciting website: www.access2designs.com. Please send us an email requesting information and we would be happy to help you as this company is not currently listed as one of our manufacturers but we do have access to this item. I am an interior designer who created an opportunity for the design savvy person to purchase to-the-trade products at wholesale pricing, without having to hire an interior designer. Please visit our site where we have over 500 "To The Trade Only" manufacturers to shop from… Our clients NEVER pay retail! Have fun!!! Similar looking bench available at Wayfair. Search "demilune upholstered bench". Paint - Would love to know paint colors for walls! Love the rug - Can you share what company sells this. Thank a bunch! Yes! Please call our office at 803-799-1177 and we would be happy to talk to you about pricing. Do you sell any more of the paintings above the bed? I love the painting. where can i purchase the rug? - where can I purchase the rug? The rug is from Jaipur. Please call our office to inquire after purchase! We would be happy to give a price to you! Where are the nightstand tables from? The nightstands are from Bungalow 5. We would be happy to give you a price if you purchased through our firm. We sell these nightstands. We would love to help you!! Carpet - Where can I find the carpet? Hey there! This rug is by Jaipur, please contact our firm for more details! Where can I buy this bedding? The entire set please. Hey! This bedding is by Pine Cone Hill, please contact our firm for pricing and availability! Where is the bed from? I need to know! Hey Yady! This bed is by Phillips Scott, if you'd like more info on pricing and availability, please call our firm. Wall color? - What is the name of that blue? What is the fabric on the small pillows? - I like it and can't seem to find that color combination. where can I buy these bedside lamps? Could the look of the windows be replicated with tall mirrors? - I love everything about this room, however I don't have those fabulous windows flanking my bed. Could the look be replicated with tall mirrors perhaps? I think I'm going to do the window look with an two old windows, place mirrors in them and be able to do the curtains to replicate the look in this picture. Tag - What is this referencing? What is the color of this beautitul ceilling? wall color? - What color/brand is the paint? it's beautiful!! Thank you! All the paint used was Sherwin Williams, the navy is 6244 Naval and the other walls are 7015 Repose Gray. We are happy to hear that! The navy paint is SW 6244 Naval. Wall color? - The blue wall color please,thank you! What color is the bedding from at Pine Cone? - Also is it a matelasse coverlet? The blue goes so well with the wall cover. Thanks so much! Where is the bedding from? - I love it with the wall color. It's beautiful. The bedding is by Pine Cone Hill. Table lamps - Where can I find the table lamps? The lamps are Cloris table lamps, we'd be more than happy to give you pricing. Please contact our firm. Painting - I love the painting above the bed. Can you tell the name and where it was purchased? Thanks, and beautiful room!!! The painting is an original. Please contact our firm for purchase. Ceiling height? - Can you tell me the approx ceiling height? The ceilings were between 11'-12' high. Where is the rug from?? - Where is the rug from? We purchased the rug through Surya. Paint Color - What is the paint color on the opposite walls? Thank you. The walls are done in Sherwin Williams Repose Gray. The accent wall is Sherwin Williams Naval. Where is the bedding from? - Can you tell me where the bedding was purchased? Love it! So glad you like it! The matelassés are from Pine Cone Hill and the pillows and bed skirt were made from a fabric by Kravet. Artwork - I love the print above the bed. Who is the artist and do you know the title of it? Where would I be able to find this rug? - Hello, would anyone please be able to advise me as to where I would be able to find this rug? Any help would be great. Ceiling - I would like to know what kind of ceiling is in this room. It is so beautiful! Love the chandelier in the bedroom. Who makes that light? 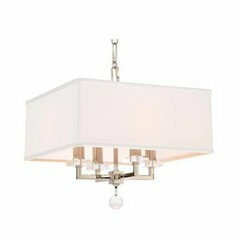 - I want to see who manufactures the bedroom ceiling light. Does Irvine in other finishes? Love the curtains - Can the curtains be purchased? Painting - I love the painting. Can it be purchased? If so, where? Bedding set - where can find bedding set thx. Paint color? - What's the paint color? Is this the paint code? - Paint code? Love how the rug fits. What size is it and what size bed? Dimensions - What are the dimensions of the room? Where did you get the bedframe and do you know the dimensions? Art - Who is the art over the bed from? What is the deep blue color of the accent wall? Ceiling light fixture? - Could you tell where it's from? Thanks!! What - What is the paint and color of the paint on the wall behind the bed? Bedding - Where do I buy the bedding? Are the curtains custom? - Are they two separate color panels or one with a navy stripe? Thanks! Great room!! Love the drapery hardware. What company? What is the fini - Drapery hardware? The windows flanking the bed - question on height - Can you please tell me approximately how far off the floor the windows that flank the bed are? Are the night stands higher than the bottom of the window? My soon-to-be-built mster bedroom has a similar layout and I'm not sure how high to make the windows. From this photo, it looks like maybe it doesn't matter how low they go. Any thoughts on what is preferable? Thanks for your response. What is the Kravet fabric type and color? Thank you! i need your advice. Is it pretty whit an lower ceiling and less space? Thank you Steven for the most awesome master bedroom ever!!! You are A - Thank you for making our Dream Home the best ever ! Wall color - What are the two wall colors for this room and brand? Placing a bench at the foot of your bed is another way to anchor your bed’s position in the room. Plus, it’s a good drop-off place for a robe that might otherwise end up on the floor. Bed benches are also knee savers against sharp bed frames and platform beds, because they force you to walk around the end of the bed rather than brush by it. I like this demilune shape because it reinforces a natural circulation around the bed.